Greetings again from the darkness. Learning from those at the top of their game is always fascinating, regardless of what their game, industry, business, or talent is. We want to hear what ‘the best’ has to say. What was their path to the pinnacle? What was their formula for success? Director Marieke Schroeder focuses her lense on Charles Schumann, the world famous bar owner, mixologist, and author. It wouldn’t be wrong to refer to him as the guru of bars. Mr. Schumann cuts a dashing figure with his shock of long gray hair and his colorful custom suits. His reputation precedes him as he visits world class bars in Munich, New York City, Paris, Havana, Tokyo and Vienna. Schumann has disciples throughout the industry – those that have learned the bar industry from one of his publications (including “Schumann’s Bar Book”), or by studying his own Munich establishment, Schumann’s bar. As we travel along on his globetrotting-bar-hopping trek, it’s very interesting to see the differences and similarities in bars located thousands of miles from each other. We also get a bit of a history lesson as cocktails are tracked back to 1803, and the evolution of NYC bars from prohibition to disco to today’s more intimate neighborhood bar is noted. 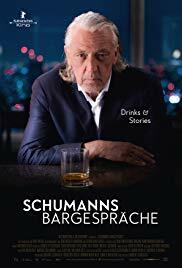 There are interviews with barkeeps, bar owners, a cocktail historian and a journalist, and the most interesting segments are the exchanges with Schumann himself – especially with a female bar owner who seeks his respect and acceptance. We visit Hemingway’s Bar in Paris and learn of the namesake’s family connection, and a trip to Havana educates us on how crucial Cuba became as a U.S. supplier during prohibition. As a bonus, we learn the purity and tradition of creating Cuban rum. The Tokyo segment is quite unusual in that the best bars might have seating for less than 10 people, and the precision ice block-cutting is a rare skill to behold. Another observation from the numerous bar stops is that each bartender has their own style when it comes to the vigorous shaking of certain cocktails. Charles Schumann is dedicated to the industry and the craft, and is now an influential spokesperson and consultant, in addition to being a well-known bar owner and mixologist. Director Schroeder changes the music for each locale, and leaves us with a message that seems impossible to argue against: cocktails are a pleasure to drink AND create. This entry was posted on Thursday, December 13th, 2018 at 9:38 pm and is filed under Documentary. You can follow any responses to this entry through the RSS 2.0 feed. You can leave a response, or trackback from your own site.